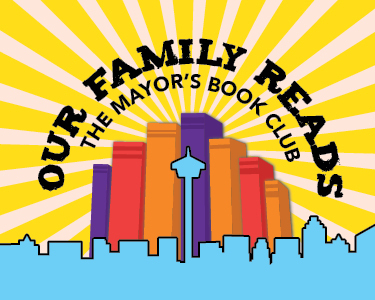 Our Family Reads: The Mayor’s Book Club was created by Mayor Ron Nirenberg to encourage families in the community to read along with him and members of City Council about some of their favorite topics, and to cultivate a community experience. Discover the rich history of African-Americans and the pivotal role they have played in America’s story. Councilman Greg Brockhouse invites you to learn more about Black History with him and his family this August. A lush and lyrical biography of Harriet Tubman, written in verse and illustrated by an award-winning artist. We know her today as Harriet Tubman, but in her lifetime she was called by many names. As General Tubman she was a Union spy. As Moses she led hundreds to freedom on the Underground Railroad. As Minty she was a slave whose spirit could not be broken. The story of one family's journey north during the Great Migration starts with a little girl in South Carolina who finds a rope under a tree one summer. She has no idea the rope will become part of her family's history. But for three generations, that rope is passed down, used for everything from jump rope games to tying suitcases onto a car for the move north, and even for a family reunion where that first little girl is now a grandmother. Each day features a different influential figure in African-American history, from Crispus Attucks, the first man shot in the Boston Massacre, sparking the Revolutionary War, to Madame C. J. Walker, who after years of adversity became the wealthiest black woman in the country , to Barack Obama, the country's first African-American president. With powerful illustrations by Shane Evans, this is a completely unique look at the importance and influence of African Americans on the history of this country. This is the story of the men, women, and children who toiled in the hot sun picking cotton for their masters; it's about the America ripped in two by Jim Crow laws; it's about the brothers and sisters of all colors who rallied against those who would dare bar a child from an education. It's a story of discrimination and broken promises, determination, and triumphs. This inspiring book demonstrates that in gaining their freedom and equal rights, African Americans helped us all as we work towards the promise of liberty and justice for all. When Mariah and her young brother Zeke are suddenly freed from slavery, they join Sherman's march through Georgia. Mariah wants to believe that the brutalities of slavery are behind them, but even as hope glimmers, there are many hardships yet to come. When she meets a free black named Caleb, Mariah dreams in a way she never dared . . . of a future worth living and the possibility of true love. But even hope comes at a cost, and as the difficult march continues toward the churning waters of Ebenezer Creek, Mariah's dreams are as vulnerable as ever. In this powerful exploration of a little-known tragedy perfect for fans of Ruta Sepetys, readers will never forget the souls of Ebenezer Creek. Samuel and his younger brother, Joshua, are free black boys living in an orphanage during the Civil War, but when Samuel takes the blame for his brother's prank, he is sent South, given a new name, and sold into slavery–and somehow he must survive both captivity and the war, to find his way back to his brother. One of the most important and enduring books of the twentieth century, Their Eyes Were Watching God brings to life a Southern love story with the wit and pathos found only in the writing of Zora Neale Hurston. Out of print for almost thirty years--due largely to initial audiences' rejection of its strong black female protagonist--Hurston's classic has since its 1978 reissue become perhaps the most widely read and highly acclaimed novel in the canon of African-American literature. The phenomenal true story of the black female mathematicians at NASA at the leading edge of the feminist and civil rights movement, whose calculations helped fuel some of America's greatest achievements in space--a powerful, revelatory contribution that is as essential to our understanding of race, discrimination, and achievement in modern America.